The following story was formed after an interview I had with my Great Aunt Lila Shepherd in 1998 when she was nearly 100 years old. “The first or the second?” she asked. “I was thinking of World War I,” I answered. “Well, I remember I was 14 when the war started. It happened in the middle of summer. My brother, your grandfather, Hugh was twenty that summer. As the war progressed the men on the island were told to watch for anything strange in the Bay as some of the men who worked at the Life Saving Station talked about sighting German U-boats in the area. Aunt Lila told me enough details that my curiosity sent me to search for some other reports on the event. I learned the Dornfontein, a 766 ton schooner built in Saint John by Marine Construction Co. was on its maiden voyage. The ship held about six months’ worth of supplies and provisions to be used on the lengthy sail from Saint John to Durban, South Africa. On August 3, 1918, the military authorities ordered that the city of Saint John would remain in complete darkness. The Halifax Herald offered a $5000 reward for information which led to the location of the U-boat. It also offered a $500 reward for information leading to the arrest of any of the enemy agents infesting Halifax. After the Dornfontein was stripped of its supplies and clothing, the German captain set the ship on fire. As a small act of mercy he allowed the crew on the Dornfontein to escape in a dory and they landed at Gannet Rock. The ship didn’t sink right away as its load of lumber kept it afloat as it rested against the ledges near Gannet Rock. Several family members rowed out to take pictures of the burned out hull. I found the copy Aunt Lila referred to after her death and just as she said, the faded black and white picture doesn’t show much of the ship. In fact, it looks more like a gutted log floating on the water but on the back I’d seen where my aunt had printed the word Dornfontein. This ship was not the only one to suffer from a German attack for the German’s mission was to destroy the North American fishing fleet. 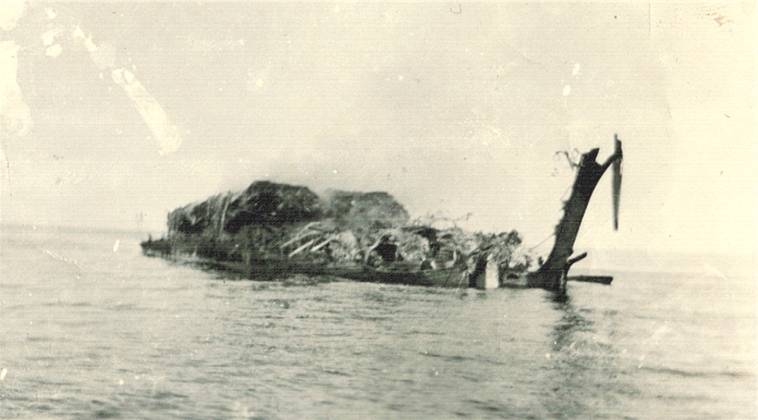 The U-156 was responsible for the destruction of thirty-six ships before it met its own demise when it was destroyed by a mine while heading back to its home in Germany.